Ananias.org » Blog Archive » Whither the Christian Science movement? Whither the Christian Science movement? Editor: Can Christian Science, originating in the more closed information environment of the 1800s, endure in today’s wide-open setting? That’s the question in this fourth part of our five-part conversation with former practititioner Tanner Johnsrud, who is now a baptized Christian. His first three posts are here, and here, and here. We set up the present one by saying to him: “Mary Baker Eddy in 1902 declared her belief that ‘It is undoubtedly true that Christian Science is destined to become the one and the only religion and therapeutics on the planet’ (Miscellany, p. 267). Tanner answered thoughtfully and at length. In so doing, he both addresses what has happened in our time to facilitate many people’s reevaluation of CS truth-claims, and sketches what could happen as other uneasy Csers move along the informational roadmap outlined here. Tanner Johnsrud: First of all, let me say that I am not a prophet. (Mrs. Eddy probably wasn’t either, but that’s a separate question.) Speaking for myself, I wouldn’t claim to know with certainty what the future holds for the Christian Science movement. Anyone can see, however, there are certain trends that are in place in the Christian Science movement that would surely have to be reversed if it were ever to begin fulfilling Mrs. Eddy’s prophecy. Any Christian Scientist knows that the Christian Science church is in a period of significant numerical decline. All they have to do is look at their emptying and closing churches. But they almost assuredly are not aware of the numbers. In January 1971 there were 1829 churches in the United States. Today are there 721 churches in the United States. That is a 60% drop – a closure of over 1100 churches. In January 1971 there were were 4965 practitioners in the United States. Today there are 809 practitioners in the United States. There has been a decline of 4156 practitioners during this space of time, a drop of 84%. In 1999 there were 53,290 subscribers to the Sentinel. Today there are 13,013. That is a less than a quarter (24.4%) of what there were 20 years ago. Some might argue that there are more JSH-Online subscribers, but the number of subscribers was following this trend line long before JSH-Online appeared. Every three years up to 30 practitioners are taught a one week class giving them everything they need to know to become Christian Science teachers and train future practitioners. In December 2018 the Normal Class had only 15 students. They in turn can take classes of no more than 30 students each year. (And today, most classes are far fewer than 30.) But by taking a Normal Class of fewer than 30 students, The Mother Church is, itself, limiting its potential for future growth. Based on the continuing numerical trends dating back to 1971 alone, in 20 years there will be no more practitioners, and in 25 years there will be no more churches. To be clear, some of my friends who are practitioners may still be practitioners 30 years from now. The Sentinel is subsidized by The Mother Church, which has over $1 billion on hand, so the Sentinel and the other periodicals won’t disappear completely. The Mother Church in Boston and a few branch churches have enough money and people, for now, so they might exist, too, even after the mathematical trend lines say that CS will go extinct. But bottom line:the trends are in place for the Christian Science church to all but disappear in my lifetime. Were the Christian Science church to begin reversing these trends, and move to fill the role that Mrs. Eddy prophesied for it as the only system of religion and healing on the planet, there are some challenges that they would have to overcome. Consider, first of all, that when people rely on a single source or a single stream of information, their worldview will likely be shaped by that single stream – and so it once was for most of Mrs. Eddy’s followers. But in today’s world, there are many sources of information, and this presents a challenge to the Christian Science worldview. To explore this, let’s move through 13 topics, looking first in some detail at The Christian Science Monitor and then at the overall opening-up of information technology and access to information. 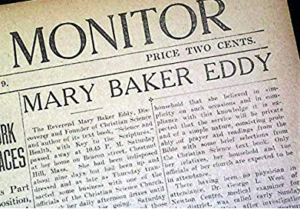 In 1908, in the wake of newspaper articles carrying verified investigative reporting into the life of Mrs. Eddy, as well as other papers carrying rumors and falsehoods, she commanded her church to begin at once to start a major daily newspaper, The Christian Science Monitor. For the last century, the writers and editors of the Monitor have tried to figure out how to do Monitor journalism in accord with Mrs. Eddy’s instructions. And the publishers of the Monitor have tried to figure out how to make it profitable. The Monitor has been, for many decades, a money-losing endeavor for the church. Mrs. Eddy indicated that the profits from the Christian Science Publishing Society should be turned over to The Mother Church each year. But in the whole history of the Monitor, it has made a profit in only two years. (Monitoring the News, p. 40) Despite decades of heavy subsidies, and many editorial shakeups, blue-ribbon panels, cost-cutting measures, marketing pushes, ending its daily print edition, and more, the Monitor still fails to fulfill Mrs. Eddy’s intention that it would generate profits for the church. When I was a Christian Scientist, I wholeheartedly believed that the difficulties that the Monitor has faced, financially and otherwise, had been due to the Monitor not being strict enough in following Mrs. Eddy’s instructions for the paper, and that if the paper just rededicated itself to following her vision and instructions, everything would turn around. The Mother Church has a significant amount of money on hand (over $1.1 billion). And so it will continue to subsidize the Monitor for years to come. But one has to wonder, if Mrs. Eddy was the spiritual seer that her followers claim, why did she not foresee the tremendous financial difficulties that publishing a daily newspaper would entail? The Christian Science Monitor must never, therefore – according to Mrs. Eddy’s wishes – print anything about the work of women without including her. Think about how such a policy, actually enforced, would have changed coverage of the 2016 presidential election, for instance. Today we might consider such a statement more like obsequious praise or propaganda than journalism. The Monitor doesn’t write in the same way of Mrs. Eddy today in its non-religious articles. But in its earliest days, the Monitor staff did, at times at least, follow Mrs. Eddy’s directives on how it should speak of her. Another way in which the Monitor presents a unique brand of journalism is through its selection of stories, and of how to present them. In 1906 a major earthquake caused significant destruction in San Francisco. Lewis Strang, who was one of Mrs. Eddy’s secretaries at the time, wrote to a Christian Science teacher on his Leader’s behalf. While the San Francisco earthquake occurred two years before the founding of the Monitor, that ethos remained at the Monitor for many years. According to Louise Baum, Mrs. Eddy even objected to having the word “snow” appear in the pages of the Monitor. Think about the narcissism embodied in that quote about the San Francisco earthquake. To think that a tiny handful of Christian Scientists thinking the right way would have stopped the earthquake – this makes the thoughts of men, not the will of God, all-powerful. And the guilt that such false teaching perpetuates is immense. Imagine receiving that letter and essentially being told that an earthquake that destroyed 80% of the city was your fault because you weren’t thinking the right thoughts. As a personal note, one of my immediate emotional responses to 9/11 was guilt. I thought that had I truly been on top of things, metaphysically, those planes wouldn’t have been hijacked. While this may or may not be the majority view among Christian Scientists, as a practitioner I spoke to countless Christian Scientists who, at one level, blamed themselves or the failings of their fellow Christian Scientists, for various world problems from tornadoes and tsunamis to economic difficulties or the election of presidents they didn’t like. Such a view, with its attendant egotism and guilt, is consistent with the communication in the above letter. I have a number of people I care about deeply who work for, and have worked for, the Monitor. And I think that to the paper’s great credit, it has by and large not hewed to the journalistically inappropriate intention that Mrs. Eddy had for it. The people I know who are working at the Monitor today are hard working and conscientious, would disdain fawning propaganda, and are trying to publish quality objective journalism. I have no doubt that the Monitorhas earned all of its Pulitzer Prizes through the years. Granted, then, that the Monitor today doesn’t always follow Mrs. Eddy’s instructions – and fortunately so. But it does try to emphasize good things, and not focus on tragedy or suffering. Where it does cover such stories it seeks to find a silver lining, or it emphasizes those who are doing good things to respond to such a disaster. While it is admirable to focus on the good things people are doing, such a view echoes the theologically problematic Christian Science worldview – focusing only on good, and denying evil. We’ve come a long way from the days when The Christian Science Monitor was the only, or even the primary, news source for most Christian Scientists. Because Christian Scientists today get their news from other sources that don’t share the Monitor’simplicit worldview, their worldview is shaped by these other sources. As such, there is much more going on to shape their worldview. I heard from many Christian Scientists through the years who might watch MSNBC or Fox News for their news (and subsequent worldview) – and then guiltily look at their pile of Monitors that they haven’t gotten around to reading yet. I know a great many Christian Scientists who loyally subscribe to the Monitor even though they don’t like the journalism found in its pages. The Christian Science Monitor is a news source which, according to its founder, was to put forth stories about her, and beyond that, exert de facto control over much of the public information coming to the church members. The news stories selected by the Monitor, and the way in which those stories are reported all reflect, to varying degrees, the implicit Christian Science worldview. The information that comes to church members who rely solely on the Monitor for their information is quite limited as a result. Information management and control is a typical hallmark of a destructive group. And for many decades the Monitor did serve as the primary news source for members of The Mother Church. But could it be that now with the proliferation of news sources, more and more Christian Scientists around the world are losing their strong fidelity the Christian Science worldview? Again, one of the signs of a destructive group is that they control or manage the information that comes to their members. In its earliest days the Monitor served to provide propaganda regarding Mrs. Eddy. From then to now it has also carried forward the implicit Christian Science worldview – focusing on the good and denying evil, sin, disease, and death. But as Christian Scientists increasingly get their news from other sources, their worldviews are changing, and some of them are leaving Christian Science. The internet has made information of all sorts far more available. Not only do most Christian Scientists today don’t get their news primarily from the Monitor. Many are seeking spiritual resources beyond those found in the Reading Rooms. This information makes it far harder to sustain the CS narrative. Of course, this information, this knowledge, isn’t what will ultimately lead people to Christ, only the Holy Spirit can do that. But the Holy Spirit might use it to help bring people to Christ. God certainly used it to help lead my wife and myself to Christ. And I know He has done so for others, as well. As a practitioner I heard fairly regularly from patients who would say some version of, “I know I shouldn’t do this, but I googled, and I think that I have this particular disease.” The internet has made medical information widespread. You can go to any number of websites and enter your symptoms and the website will return a diagnosis. This is no substitute for consulting with a physician. But this has made it possible for Christian Scientists to find out medical information in the privacy of their home that wouldn’t have been available to them 30 years ago. This is just one of many factors that has led an increasing number of Christian Scientists to have “one foot in both camps”, or to leave CS altogether. Personally again, a few years ago I would have been deeply critical of anyone “going the medical route” – though I wouldn’t have said anything to them. Now I’m so grateful to see many Christian Scientists getting the medical care they need. The culture among Christian Scientists is changing, I think, and being more accepting – albeit to varying degrees – of mixing “metaphysical treatment” with “materia medica.” In some cases that may mean that people will drift out of Christian Science altogether. In other cases, because they are not following the full teachings of Christian Science, some Christian Scientists might stay in it because they haven’t dealt with the full implications of its faithfully followed teachings. Many people outside of Christian Science don’t realize that just as a Christian Scientist would be unlikely to seek out medical help, they would also be unlikely to seek psychological information or help. The very term “personality” is largely pejorative in Christian Science. For many Christian Scientists, emotions are to be suppressed. For instance, I know of someone who was told not to cry at the passing of a loved one because you are just feeling sorry for yourself, and tears of grief are selfish. Many other Christian Scientists I have talked to through the years share similar stories of being told they should repress their emotions. But the internet has made access to information about mental and emotional health far more accessible. While a Christian Scientist might never seek counseling or therapy, they might find information about dealing with grief or other emotions online. They might learn about different issues such as depression or anxiety. They might take a personality test to find out more about their personality. This kind of information is helping Christian Scientists become more aware of their feelings and personalities and helping them to challenge the Christian Science worldview which teaches suppression of feelings rather than bringing freedom and healing to them. God made us with a full range of emotions. The Psalms put them all on display. And Jesus, who was completely perfect and free from sin, was saddened, grieved, angry – all without sin. When a Christian Scientist says that someone shouldn’t grieve the loss of a loved one, for instance, they are subtly suggesting that they are more spiritual and perfect than Jesus. Mrs. Eddy told people to “find me in my writings.” And Google Books enables that in an important way. Google Books is incredible. They have digitized many millions of books. Someone today could read the first edition of Science and Health and find a number of statements that a Christian Scientist today might find troubling. At one point Mrs. Eddy bought up copies of the first edition that were in circulation, so as to keep it out of the minds of her students, as she said. It is a hallmark of a destructive group to control information and keep certain previously published material from its members. The Jehovah’s Witnesses do this, for example. Interestingly, for a number of years not even the Christian Science Board of Directors had full access to the archives of Mrs. Eddy’s writings. There are also numerous biographies of Mrs. Eddy – both pro and con available through Google Books. (I had never read a critical biography until after my conversion.) And there are many other books critical of Christian Science that are available via Google Books. I never had this inclination as a Christian Scientist, but perhaps someone may wish to read a positive biography, such as Christian Healer, juxtaposed with a critical biography such as Milmine and examine sourcing, commentary, bias, and so on. One can look at Mrs. Eddy’s claim to have healed well-known people such as John Greenleaf Whittier, whom she said she healed of tuberculosis, and check it with the historical record of Whittier’s life. All of these things can be read in the privacy of one’s own home. They can read the writings of Phineas Quimby online. They can read the writings of ancient Gnostics (against whom the entire Book of Colossians is directed), and decide for themselves how closely Christian Science resembles those teachings, particularly in some of Mrs. Eddy’s earliest writings, before she had editors revise her material. The Mary Baker Eddy Library has made most of her papers available on site, and they are working on making more and more of them available online. Additionally there are many reminiscences of Mary Baker Eddy by her students that are available at the Library. While almost all of the reminiscences are written from, shall we say, a highly laudatory perspective – it might cause the reader to ask, where is the praise by these writers for Jesus? This was another question among many that I could never answer. There will be more and more information coming out about the history of Christian Science, and Christian Scientists will be able to sit in the comfort and safety of their own home and read and evaluate it for themselves. The Book of Mormon purports to be a divine revelation telling the historical account of ancient tribes in the Americas. However, there is no historical evidence to support the claims of the Book of Mormon, and all of the historical evidence shows that the Book of Mormon has no basis in truth. Likewise, the Koran purports to be a divine revelation but it gets some basic facts about the Bible and Christianity wrong, and presents gross historical inaccuracies. Access to historical information online has led to numerous Mormons and Muslims leaving the religions of their childhood and in many instances becoming Christians. Christian Science similarly has many problems with history. For instance, the CS narrative suggests that the early Christians all went around healing people, but that this was lost at the time of the Council of Nicaea. There are countless books and websites that make information about early Christianity readily available. If you study those books you find that no scholars or historians assert this narrative. Healing like Jesus and the apostles performed did not continue on in the early centuries of Christianity. We have the writings of various Christians (as well as writings of those attacking Christianity) from both before and after the time of the Council of Nicaea, and this narrative is just not present in the historical record. Most Christian Scientists in my experience knew next to nothing about the Council of Nicaea. (Mormons and Muslims and other similar groups also tend to have a highly incorrect view of the Christian trinity, as well as completely ahistorical mischaracterizations of the Council of Nicaea.) Many Christian Scientists I have talked to assume that the Council of Nicaea declared that Jesus is God for political reasons, and that wasn’t the position of the early church, pre Nicaea. The problem with this view is that there is now a wealth of information available about the early church, and it is obvious that the early Christians held to Jesus as God from even the first generation. And even ardent (but honest) scholarly opponents of Christianity recognize that the Council of Nicaea didn’t invent Jesus’ divinity. Concord – a computer program which allows you to search the Bible and Mrs. Eddy’s writings – is an important tool. You can do basic searches like the word “love” or more complex searches like every place that the words heal or cure are used with the words Jesus or Christ. I remember being consistently surprised by how few references there were in that latter search, and wondering if there was more to the Biblical narrative than it being a book about healing. In addition to doing basic or complex searches, you can also search how Mrs. Eddy uses Bible quotes. So you can see that Mrs. Eddy cuts out important parts of verses. For instance she says “Believe… and thou shalt be saved” – cutting out the important point, that the Bible says “Believe on the Lord Jesus Christ, and thou shalt be saved” (Acts 16:31). A Christian Scientist might want to ask themselves why she omitted the name of the Lord Jesus Christ, the object of our belief, and thus the most important part of an important verse. To take away the object of that belief is to make the mere act of believing something that can save – which is a gross mangling of what the Bible is teaching. Or they can look at her use of the phrase from Habakkuk 1:13, “Thou art of purer eyes than to behold evil.” They can look at how that occurs in Habakkuk and see if her interpretation of that phrase makes any sense in its original context – or if, in fact, it means the very opposite of what she taught. Christian Scientists can check their Leader’s usage of scripture in the comfort and safety of their own homes to see if it is consistent with the Bible, or if she is, in fact, doing violence again and again to the words of the Bible. There are wonderful and very powerful Bible study programs available for purchase, but there is also much that is available for free on the internet. You can begin to study the Bible in the Greek and Hebrew. A Christian Scientist can readily check to see if Mrs. Eddy has given the correct interpretation of things on even the most basic scriptural points. For instance, they can look to see how Elohim is used in the Bible, and they can find that it occurs numerous times in Genesis 2 and 3. Recall that Mrs. Eddy sharply differentiated between Elohim in Genesis 1 and Jehovah in Genesis 2 and following. She also distinguished between Jehovah and the “Christian Science God” (Science and Health 140). Well, I would certainly agree that the CS god is not the Jehovah of the Bible – for Christian Scientists who inquire can find that the New Testament writers said that various Old Testament passages that refer to Jehovah were referring to Jesus. And then they can consider, for themselves, whether or not Mrs. Eddy has given them the correct understanding of God and of Genesis. Music is so important to our worship. It both expresses and shapes our praise and worship. For centuries Christians have written powerful and beautiful hymns that have inspired millions of people. A CS friend of mine asked me years ago “where are the great works of art and music inspired by Christian Science?” I gave a lame answer in response – but I never forgot the question. There are hundreds of hymnals of every denomination available online, many gathered onto a single site such as hymnary.org. And you can listen to so many beautiful hymns online. So many of the hymns in the Christian Science Hymnal are “adaptations” of traditional hymns. But when you look at what the traditional hymns actually say, you begin to notice a pattern. For instance, references to Jesus are taken out and replaced by references to God (in a CS, unitarian way). Safe above life’s raging sea. Be Thy strength forever mine. The whole nature of the Rock, Jesus, has been changed, and rather than singing to Jesus, Christian Scientists are singing to “Truth.” All references to Jesus, his blood, atonement for sin, deliverance from wrath have been completely removed in the CS version, certainly without the approval – and quite contrary to the teachings – of the original author, Augustus Toplady. And these changes which violently alter beloved Christian hymns happen again and again throughout the Christian Science hymnal. But these changes also happen in hymns which have been completely rewritten, such as Martin Luther’s “A mighty fortress is our God.” Martin Luther would not be pleased – to put it mildly – to see what had been done to his hymn, which, like so many of his hymns, was based upon a psalm. 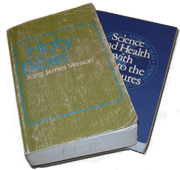 When you look at how much the Christian Science hymnal has changed the theology, you might begin to ask the question “Why?” Why have references to Jesus, the cross, his blood, his atoning for sin, the Trinity, and so many other Christian teachings been consistently taken out of traditional Christian hymns when they appear in the Christian Science hymnal? Why even bother adapting traditional Christian hymns and then entirely replacing the theology? Why is it that references to Jesus apart from him being a teacher, example, or healer have been stripped away from the hymns Christian Scientists sing? Paul says that “the word of the cross is folly to those who are perishing, but to us who are being saved it is the power of God” (I Cor 1:18). And he speaks of “the offense of the cross.” (Gal 5:11). The cross is foolish and offensive to those who persecute Christianity and those who are perishing. Peter says that Jesus himself is “a rock of offense.” The very name of the Biblical Jesus is offensive. Peter knew this first hand for he himself denied our Lord three times; he had been offended at the very name of Jesus. But Peter came to experience the glorious redeeming grace that comes only through Christ Jesus, and the name of Jesus was dearly precious to him. Even those who were once offended at the name of Jesus can repent and find forgiveness in Jesus Christ. On the day of our conversion, my wife and I talked to a practitioner about our decision. He said that of course the Christian Science church loved Jesus, that at the dedication of The Mother Church someone reported that the bells chimed the hymn “All Hail the Power of Jesus’ Name.” Now, that is a beautiful hymn, and has been a favorite of mine since I came across that reference in Pulpit and Press. But that hymn has completely different words to the same tune which appear in the CS Hymnal. The reporter, who was standing outside as the chimes played, assumed that the hymn that was being played was “All Hail the Power of Jesus’ Name.” But the words to that hymn are absolutely foreign to the average Christian Scientist, and would be deeply uncomfortable to many Christian Scientists. If some brave Christian Scientist reading this doesn’t believe me, maybe they could suggest that “All Hail the Power of Jesus’ Name” be sung as a solo or as a hymn, and watch the reaction of the church in response. Traditional Christian hymns, as well as new Christian hymns, are available online, and Christian Scientists are able to hear the gospel message sung in a deeply moving way. They may not read works of historic Christian theology, but they will listen to traditional Christmas carols, or to Christian music on the radio, or to Christian hymns online. And this can help to cut through the deception and preach the gospel message deep to their hearts. It did so for me and my wife. The week after our conversion we listened to “In Christ Alone” on repeat more times than we could count. When we converted, our new pastor asked us if there was anything we needed, our answer was “A hymnal!” (One was soon provided, and we love our Trinity Hymnal!) Now every week at church we just rejoice in the wonderful Christian hymns that we get to sing! With the internet, hundreds of thousands of sermons are being put online every year. Obviously these range widely in quality, to put it mildly. But there are great sermons being made available. There are far more great books available from a Christian perspective than could be read in a lifetime. And social media has made the different voices of Christian ministries and Christian leaders available. They are speaking about important cultural issues in ways that resonate with many Christian Scientists, where their own church is silent or advocates a position contrary to Biblical morality. Christians are preaching substantial messages drawn from all throughout the scriptures. These messages are meeting a deeply felt – if unrecognized – spiritual hunger in untold numbers of Christian Scientists. I talked to a number of Christian Scientists before my conversion who were feeling spiritually fed by these sermons online. There is something truly powerful about hearing the gospel preached! I was one of those people who heard the gospel preached online. It took over a decade for it to finally lead to my conversion – but it happened. And if it can happen to one of the most zealous of Christian Scientists (namely, me), it can happen to anyone.